The win was Thailand’s third from their four group stage matches, and put them atop Group B. Next for the War Elephants is a semi-final match up against the Group A second-place finishers Malaysia. The first half of the home-and-home semi-final is this coming Saturday (Dec 1) at Bukit Jalil National Stadium in Kuala Lumpur. The return game will be at Rajamangala National Stadium on Dec 5. Vietnam face the Philippines on Dec 1 and Dec 6 in the other semi-final match-up. The finals will be played on Dec 11 and Dec 15. The loss yesterday ended Singapore’s campaign, with the Lions earning two wins and two losses from their four matches. But Milovan Rajevac’s side then took over and dominated the game. In the 12th minute, a cross from Korrakot Wiriyaudomsiri was flicked on by Pansa Hemviboon, with Singapore defender Irfan Fandi putting the ball into his own net as he attempted to clear the ball to safety. Just 10 minutes later and it was 2-0. Tanaboon Kesarat made space for himself in midfield, clipping a long ball in the direction of Supachai Jaided. A skied clearance from Zulgarnaen Suzliman fell at the feet of Supachai inside the area, with the striker controlling the ball perfectly with his first touch before firing home past Hassan Sunny with his second to double his side's lead. The home side were in the mood for more and a lovely passing sequence from the War Elephants almost resulted in a third, but Adisak Kraisorn’s effort was well saved by Hassan as Singapore struggled to keep pace with their Group A rivals. Having failed to find the target himself, the silky midfielder, one of Thailand's best on the night, then looked to turn provider. He played in Thitipan Puangchan with 20 minutes left to play, but Hassan again stood tall to deny Thailand a third. On Saturday (Nov 24), Malaysia booked their place in the semi-finals with a 3-0 win over Myanmar that ensured they advance to the tournament’s last four alongside favourites Vietnam. 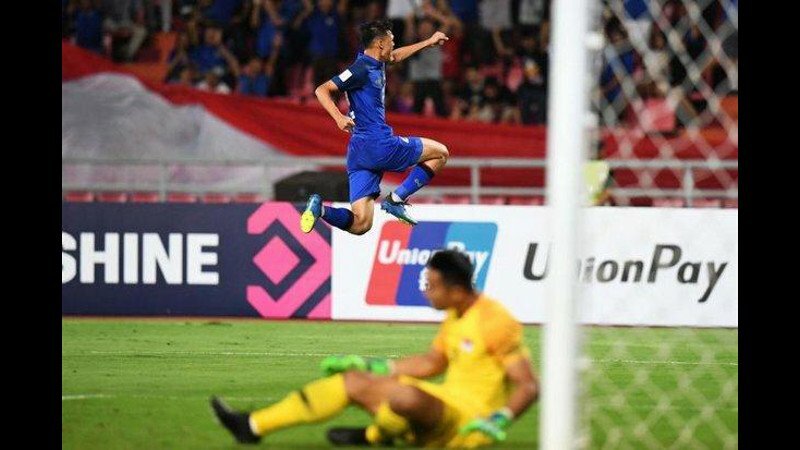 Vietnam finished top of Group A thanks to a comfortable 3-0 win over already-eliminated Cambodia while a brace from Zaquan Adha following Nohshahrul Idlan Talaha’s opener earned the Malaysians second place as a result of an impressive performance against Myanmar. Malaysia’s second place finish pits then against the winners of Group B, Thailand. The Vietnamese secured top spot with a routine win over Cambodia, with goals coming from Nguyen Tien Linh, Nguyen Quang Hai and Phan Van Duc. They face Group B’s second-place finisher, the Philippines.